Rev. 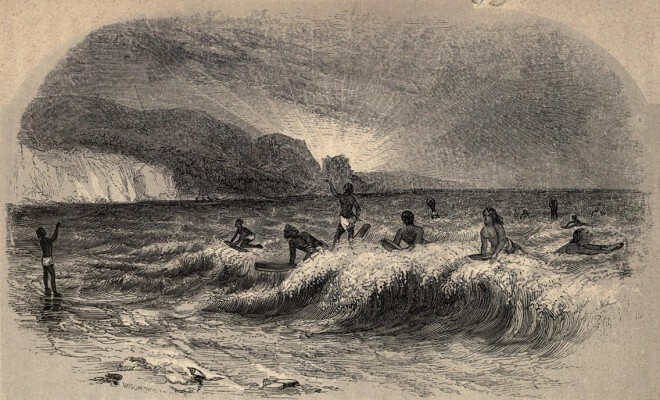 Henry Cheever : Surfriding at Lahaina, Maui, 1851. A.S. Barnes and Co., New York,1851. Cheever's report of Hawaiian surfriding is light on technical detail, however he directs the reader to the accompanying image for "a more accurate idea of it than can be conveyed by any description." However in several other aspects, the work is remarkable. Firstly, he is aware of its unique beauty of surfriding and has no doubt that it need not be confined to the Hawaiian race. Furthermore, he proposes that surfriding may, in the future, be practised in other locations; specifically the Atlantic ocean. Finally, it is impossible to ignore the immediately following account of the harvesting of trees at Lahaina and on Molokai (apparently for commerical gain) that demonstrates, in modern terminolgy, "enviromentalist values." 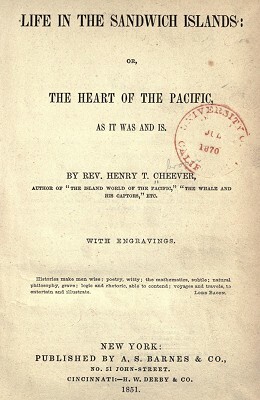 Extracts from Cheever's book, including the surf riding text and illustration, were included in a book review, titled "The Sandwich Islands Today" in The International Monthly Magazine of Literature, Science and Art, October 1851. This was the first time a surfing illustration was published in a magazine. The book was published concrrently by Richard Bentley in London in 1851, and a second edition was published by A.S. Barnes in 1856. 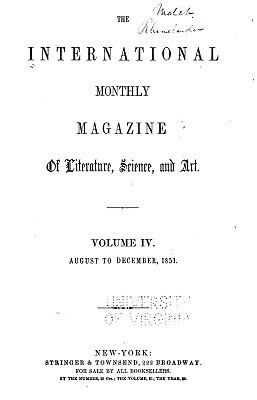 In July 1858, Cheever's 1851 account and illustration reproduced in Hutchings' Illustrated California Magazine, Volume 3 Number 1. It is highly amusing to a stranger to go out into the south part or this town (Lahaina, Maui), some day when the sea is rolling in heavily over the reef, and to observe there the evolutions and rapid career of a company of surf-players. The sport is so attractive and full of wild excitement to Hawaiians, and withal so healthful, that I cannot but hope it will be many years before civilization shall look it out of countenance, or make it disreputable to indudge in this manly, though it be dangerous, exercise. Many a man from abroad who has witnessed this exhilarating play, has no doubt idly wished that he were free and able to share in it himself. ... part, I should like nothing better, if Icould do it, than to get balanced on a board just before a great rushing wave, and so be hurried in half or quarter of a mile landward with the speed of a race-horse, all the time enveloped in foam and spray, but without letting the roller break and tumble over my head. In this consists the strength of muscle and sleight-of-hand, to keep the head and shoulders just ahead and clear of the great crested wall that is every moment impending over one, and threatening to bury the bold surf-rider in its warery ruin. The natives do this with admirable intrepidity and skill, riding in, as it were, upon the neck and mane of their furious charger; and when you look to see them, their swift race run, dashed upon the rocks or sand, behold, they have slipped under the belly of the wave they rode, and are away outside, waiting for a cruise upon another. Even the huge Premier (Auhea) has been kllown to commit her bulky person to a surf-board; and the chiefs generally, when they visit Lahaina, take a turn or two at this invigorating sport with billows and board. ... waters of the Pacific. But there is wanting on the Atlantic sea-board that delicious, bland temperature of the water, which within the tropics, while it makes sea-bathing equally a tonic, renders it always safe. The missionaries at these Islands, and foreigners generally, are greatly at fault in that they do not avail themselves more of this easy and unequalled means of retaining health, or of restoring it when enfeebled. Bathing in fresh water, in a close bath-house, is not to be compared to it as all invigorating and remedial agent; and it is unwise, not to say criminal, in such a climate, to neglect so natural a way of preserving health, as washing and swimming in the sea. In those who live close to the water, and on the leeward side of the islands, it is the more inexcusable, for it could be enjoyed without exposure in the dewless evenings; or in some places, a small house might be built on stone abutments over the water, and facilities so contrived that both sexes could enjoy this great luxury of life within the tropics. But we come back to Lahaina, to speak of a charming grove of young cocoanut-trees in the northwestern part of the town, planted by the excellent chief Hoapili, or Hoapiliwahine. ... any thing in thc form of woods that I have seen since leaving America. Six or seven years ago there was a fine grove of large green Kou (Koa? )trees in the opposite part of the town, near where the King lives, covering an acre and a half or two acres, and so ancient and shady as to afford ample covering for all the canoes in Lahaina, and all the people too. But before any one knew it, and not until it was too late to remonstrate against such a piece of savagism, the King took a freak (?) to have them all cut down to make into bowls, and spittoons, and pounding-boards for 'kalo'. Could the outraged trees have wept like the sacred grove in the Aenead, they could have dropped tears of blood at the indignity. So, on the island of Molokni, there was a fine forest of Kamani-trees, the only ones at the Islands. It is a tree of slow growth, and of great value for its beautlful wood. But the chiefs a few years ago had them all mercilessly cut down, without any care to propagate young ones, happening to want the timber to repair some vessels. It was a fair specimen of ordinary barbarism: how unlike the wisdom of Kamehameha the Great, who, when binis were ctaught for him to pluck certain feathers for his 'leis' and 'kaahilis', would not let them be killed, but set loose again, to give feathers, he said to his sons. Stringer and Townsend, New York, pages 298 - 299. "WHATEVER may be said of the influence of European and American profligacy in the Islands, they may be pointed to with perfect satisfaction for illustrations of the benefits of Christian civilization, and the people of this country are greatly indebted to the Rev. Henry T. Cheever, whose works on the subject we have had frequent occasion to praise, for the eminently judicious and interesting accounts he has given us of society, manners, and religion, and of industrial resources, and every kind of natural phenomena, throughout the " island world," especially in the Sandwich Islands, to which his last work* is altogether devoted." -page 298.
of Literature, Science and Art. Geoff Cater (1997-2013) : Rev. Cheever : Surf-riding, 1851.